Don't sacrifice aesthetic or functionality with this modular home! From the unique siding to the open and practical layout of this ranch style modular, this home is sure to have everything you’ve been dreaming of! The front door opens to a bright and spacious living room with a direct line of sight to a truly stunning kitchen. The staggered chiffon maple cabinets introduce a rustic component to this modern kitchen featuring a spacious island for additional seating to ensure there's plenty of space to entertain. But the master bathroom is the true show stopper in this home. 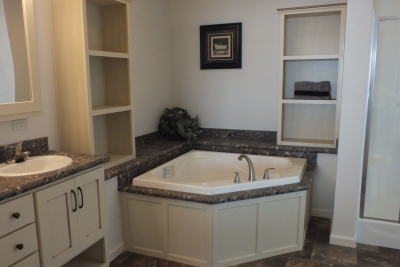 Featuring a corner soaker tub with countertop surround and shelves, this is sure to be the place you come to relax after a long day. Functionality isn’t overlooked with this home either. The double sinks in the master bathroom and spacious walk-in closet allow plenty of space to prepare for the day ahead. This home features components ideal for any family, with a gable end entry that's perfect for an attached garage, and a utility room with a sink and base cabinets for ease of use and additional storage. Is this the home you've been searching for? Click here for more photos or call our office at (802)229-2721 to speak with one of our sales consultants.